Alright, so lately I’ve been interested in apple dividers. This handy tool slices and separates your produce effortlessly. All you have to do is put the slicer in the center of your fruit, use steady pressure to push the slicer through the entire piece, and you’ll have a perfectly cut apple. And if you think that this divider is just great for the apples, then think again. Down below I’ve gathered some of the best tips and hacks so you can get the most out of your apple divider. Not only will this save you time, but these ideas will make meal prepping so much easier. So check them out and let me know what you think! If you have some fresh peaches that need to be sliced before adding to your fruit salad, you can use an apple divider rather than a sharp knife. This will also be easier if the peach isn’t super ripe. Deep fried mozzarella sticks are one of the best appetizers at a party. And if you’re someone who’s in charge of cooking, try using an apple divider to cut the mozzarella ball equally. The sizes are perfect for quick bites and ready for dipping. 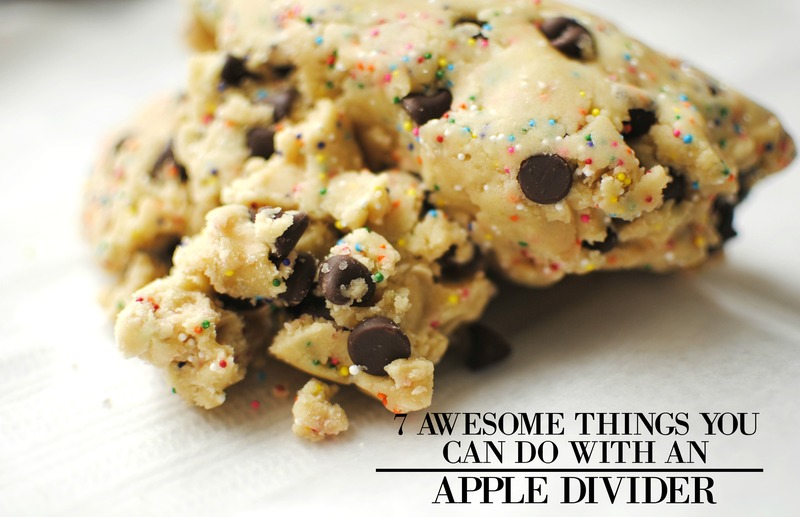 If you don’t have a cookie cutter at home, try using the apple divider. It makes it easy to cut cookie dough into equal sizes and you’ll save so much time. This is also great since you can make sure that they bake evenly. Also, why not use an apple divider to cut your pastry dough? You’ll have some cute shaped doughnut holes that are ready to pop in hot oil. Sprinkle some cinnamon or powdered sugar on top and you’re done! Whether you’re planning to make a kebab or fajitas, thick wedge-like onion slices are needed. And to easily cut them into equal sizes and without shedding tears, try using an apple divider. They’ll be ready in no time! Instead of buying precut potato wedges, try to make your own and use the apple slicer to save time. You just have to wash and peel (peeling is optional) your potatoes, slice them using an apple divider, season with salt and pepper, and deep fry or pop into your oven. They’ll taste great and your prep time will be cut in half. Just like apples, pears are also easy to slice with a divider. It divides into eight equal parts and the core is cut out separately. Try packing the sliced pears into a small baggie for a quick grab-and-go healthy snack. I hope these apple divider hacks help you get the best out of your handy tool! So definitely try them out, and let me know what you think! Now, If you have something to add to this list, comment down below. I’d love to hear from you!